A month after my arrival in Japan, my bicycle was delivered. I was so excited I almost popped a wheelie on my first ride. I buried myself in cycling, and was soon riding minutes faster than ever before. Yokota Airbase, only 34 miles outside of Tokyo, was horribly clogged with pollution. It was so thick that after riding for two hours, soot was visible on my face. On March 21, a group of nine cyclists passed me. I caught the back of the group, but they were too fast! I couldn't hold them. At the end I spoke to one of them in a parking lot. His name was J.T. Figueroa. He invited me to ride with him the next morning. Karen had told me I needed to ride with others so I reluctantly said sure. I showed up the next day, but no one was there. I was disappointed but still knew I needed to do something other than sit around and feel sorry for myself. So, gritting my teeth, I signed up for a biathon. 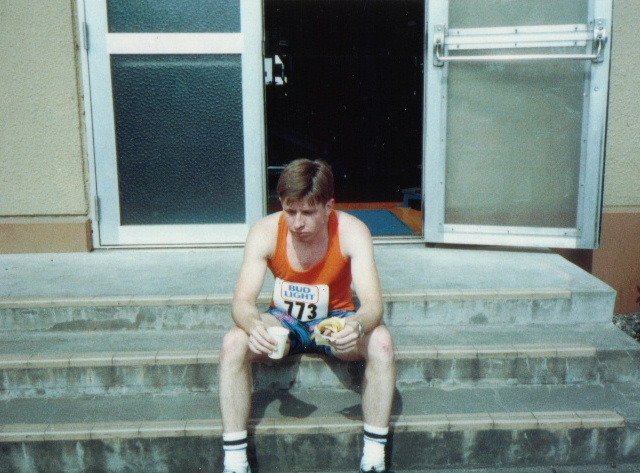 On May 14, 1988, I competed in my very first race. 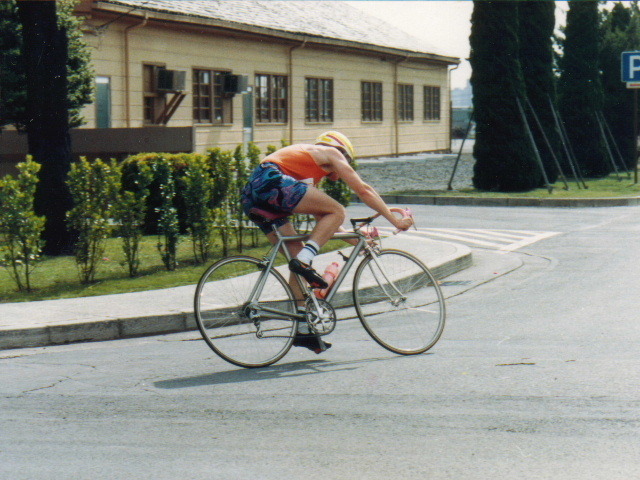 This biathlon included a 5 kilometer run, a 20 kilometer bicycle race, and another 5 kilometer run. I was tenth place after the first run, and came out of the bicycle race in third. The first cyclist I passed gave me a big boost of confidence when I heard him yell, "HOLY SH-T!" as I blew by him. After that, I knew I was riding well. I was passed by three runners in the second run and finished sixth overall. The last run was a killer because my legs were bloated from the ride, forcing me into a controlled limp rather than a real run. It was a small race with 36 competitors, and my 6th place was respectable, but where I won was in catching the attention of the cyclists, most of whom I beat. The winner, Arturo "Art" Robledo(born September 5, 1955), an Air Force Staff Sergeant, eventually became a good friend. 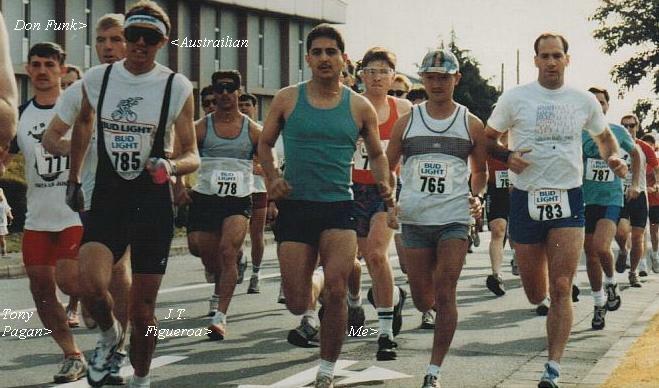 He would complete the IronMan triathlon in 1989. Also competing in this biathlon were Donald Funk (Master Sergeant), who later became my chief rival in base runs, and also a friend. Don beat me in my first three races, and I beat him in all the rest. Number 785 (see top photo) was an Austrailian who rode with us for a few months, and was always there to yell at stupid riders who got in our way. He was funny. Number 778, J. T. Figueroa (Senior Airman), became one of my dearest friends in Japan (or anywhere). He had huge, muscular legs and was a former football player. I'm the guy in orange tank top and women's shorts, wearing my $14 velcro shoes. Others who raced were Craig Hayslip (Airman First Class), my main riding partner and friend for the next few months, Clark Hamilton (Air Force Captain), an older runner who would win any run he entered. Lucky for me, he didn't enter them all. At this point I hadn't met any of these people. After this race, when I ran into them, we talked, and they said they wanted to organize a racing team sponsored by the Volvo car dealership off base. I was quickly integrated into the circle and things changed.